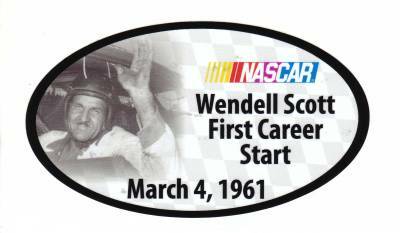 This weekend at Atlanta Motor Speedway, NASCAR Sprint Cup and Camping World Truck Series vehicles will carry a special commemorative decal honoring the late Wendell Scott’s first NASCAR Sprint Cup Series start on March 4, 1961 in Spartanburg, SC. On Dec. 1, 1963 Scott became the first African-American to win a victory in Jacksonville, FL, in what was then called the NASCAR Grand National Series. The design of the decal was shown at a press conference on Saturday at Atlanta Motor Speedway. In attendance during the unveiling were Sybil Scott, Wendell Scott’s daughter, four of Wendell Scott’s grandsons, NASCAR President Mike Helton, NASCAR Public Affairs Director Marcus Jadotte, and Darryl Wallace, driver for JR Revolution Racing and a NASCAR Drive for Diversity participant. “This is enormous for our family in so many ways,” Sybil Scott said. “My father would want the young drivers coming up today to be inspired. 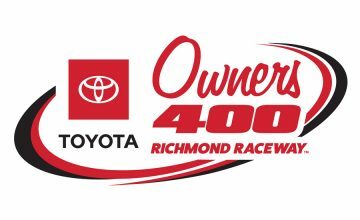 Be sure to follow DJ (@DJ_DeSpain) and Chris (@rubbings) on Twitter as they cover both the Camping World Truck Series and Sprint Cup Series races this weekend in Atlanta. 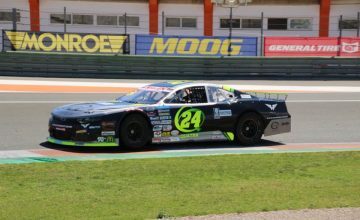 In addition, be sure to check the Facebook page at facebook.rubbingsracing.com for continuous updates.